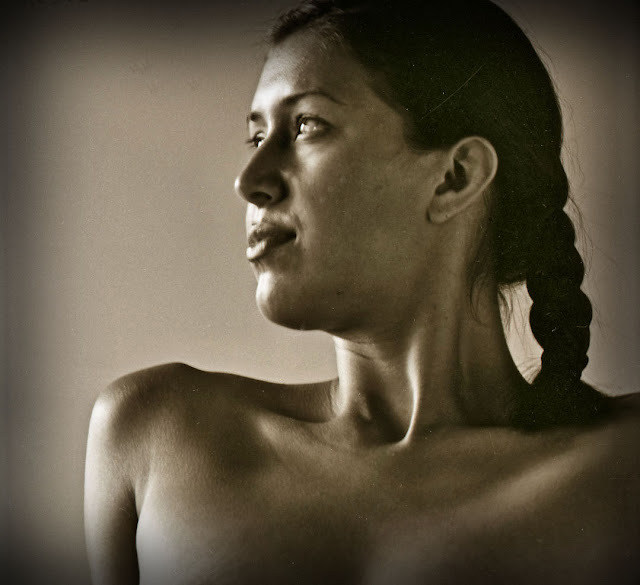 I could tell you that this is a long lost 1930 portrait of a young Mexican woman, Indiana Luna, taken by Tina Modotti in Edward Weston’s studio near Avenida Tamaulipas. I would be half right. As indeed this is a portrait of Indiana Luna, but it is one I took some years ago. I danced with Indiana the Argentine Tango. Nobody noticed my just efficient dancing style as Indiana was very good, very beautiful and very tall. She wore long and tight black dresses with a slit on the side. This portrait is not very good. It is not in sharp focus, I had to crop it for my blog viewers and worst of all I gave no room for Indiana’s head on the top of the frame. I was much too busy taking photographs of everything else. But I have come back to this image and chosen it to illustrate a realization I had in Buenos Aires in April when riding the Buenos Aires Subte (their 6 line underground). I stared at the people, most not noticing me as they were all equipped with Samsungs. I marveled at the fact that I was not in a Vancouver bus because people looked different. Even those who had a mixture of Spanish blood with indigenous did not look at all like our BC Native Canadians. These had noses, big hawk-like noses. I saw the influence of Irish immigration. There were many redhaired people. And of course in my two-week stay I spotted one (and only one) young Chinese girl walking on Calle Paraguay. I had to stare as here in Vancouver I take it all (and her) for granted. All this made me think of how in the past (not so much now with the encroachment of globalization and the universal availability of Grateful Dead T-shirts) I could spot people, as an example, in an airport and guess their country of origin. Were I to see a young man wearing penny loafers without the penny and no socks, plus, perhaps gray flannel slacks I would think, “He is Argentine.” In Vancouver I have been led astray by the similarity of Iranians to Mexicans and Latin Americans. I must wait for them to speak before I can interject my greeting in Spanish. Back in Vancouver I now stare (but carefully) at my fellow passengers and glory in our city’s ethnic (but different from Buenos Aires) diversity.